Lots of fun; decent timestretching; can mix between two stereo tracks. Crude noise cancellation; limited functionality; no automation; basic effects. R-Mix represents a potentially exciting technological breakthrough controlled via a three-dimensional, real-time spectrogram. In English, this just means that it enables you to dosomething cool while seeing the sound expressed as blobs of colour on a display. While that may seem a little weird at first, it's actually a remarkably intuitive way of working with sound that really only takes a few minutes to grasp. "R-Mix is great for inspecting sonic ingredients if they're placed in distinct stereo and frequency positions, though even then the results do exhibit noticeable artifacts." So, what is this cool thing that R-Mix helps you to do? Well, the software enables you to isolate individual components within a stereo mix using a selection box in the visual display, then process just that selection using basic mixing tools and effects, as well as noise reduction and Roland's VariPhrase technology for timestretching and pitchshifting. It's actually quite like QuikQuak's MashTactic, although both plug-ins came out around the same time, so it's not the case that one copied the other. R-Mix is a standalone app for PC and Mac (there's a simplified iPad version too), and to get you started, there are seven example projects that demonstrate what R-Mix can do. The most important is the ability to produce a 'minus one' version from a stereo recording (such as a vocal-free karaoke mix, as the manual suggests). You do this by observing which part of the display lights up when the vocal plays, moving the selection box to that area, then pulling the inside level down. It's not perfect (there are subtle artifacts, muffling and bleed), but it's impressive and good fun. Used the other way around, you could listen to just the vocal, or slow down a fast guitar solo to learn at half-speed in isolation. After a few minutes of playing around, it's obvious that R-Mix is a powerful program. At first we thought it might be good for mastering - enabling the rebalancing of problematic areas of the mix - but it doesn't seem to be designed with high-fidelity audio in mind. For example, file import and export is limited to 44.1kHz or 48kHz and only 16-bit. Furthermore, there are nonumbers on the spectrogram to indicate any sort of frequency scale, and the display is small. Having said that, it still makes for a very decent multipurpose consumer-level product. It's great for inspecting the sonic ingredients if they're placed in distinct stereo and frequency positions, though even then the results do exhibit noticeable artifacts that might discourage serious and professional users. Sadly, we were unable to find any modern commercial mixes that were sparse enough and defined enough in the frequency spectrum/stereo field to give results as good as the examples. On real-world material, even making a simple karaoke track tends to be a lot trickier than the demo suggests, since usually at least some of the sounds are spread across the stereo field. 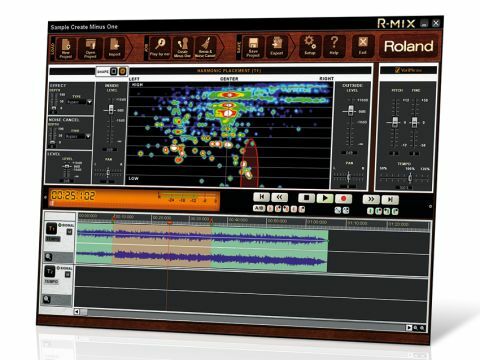 We couldn't help but wonder if the provided examples were built from recordings that were specifically produced to show how R-Mix works in optimum conditions, and to avoid exposing the weaknesses of the software. The effects included with R-Mix are basic. The Effect menu offers two compressors, three delays and three reverbs, but you can only opt for one at a time, plus they only ever apply to what's inside the selected area, and they all only have one control: a Depth slider. They're not awful-sounding, but they're certainly not tweakable enough to be used in a professional context. Why would a consumer-level user want to slap an arbitrary reverb preset on a particular sound in a mix? We'd very much like to see third-party plug-in support added. There's also a Noise Cancel menu, which can be used in conjunction with the Effect menu. In this category, you get four flavours of noise reduction that can be applied to the entire mix, again using a single slider. The results are pretty mediocre compared to the dedicated products that we've heard elsewhere, but they're not bad as an inclusion with a product at this price point. In conclusion, R-Mix does what it says on the tin well enough to satisfy the average consumer looking to mess about with their tunes. It's a fun and interesting product featuring technology that could be very exciting indeed if developed more towards the pro audio market. As it stands, it's a brilliant introduction to basic visual editing, but for more professional uses, it's not quite so impressive.